In August of 2018, a 15-year-old Swedish student decided that she’d had enough. For years she’d had the feeling that “grown-ups” didn’t care about her future; now, she was going to find a way to force them to listen. Sitting herself down outside the Parliament in Stockholm with a home-made sign and a steely stare, she vowed to go on strike from school every Friday from thereon, until her country would get in line with the Paris agreement. This student is Greta Thunberg, and ever since she started her school strike last year in the name of climate awareness, her message has gained traction around the globe. Youth-led protests are organised in solidarity with Greta’s strike, and influential environmental activists like Bono have expressed support for her cause. In a media climate where we’re informed of fresh threats of apocalyptic doom on a daily basis, Greta’s determination to be heard and to bring about change has been a source of hope for many. She delivers a much-needed sense that perhaps we can drum up the motivation necessary to take action against the currently bleak prospects. School strike for climate in Brussels, January 2019. Image credit: Bence Damokos, Wikimedia Commons. Link. Hope is otherwise a scarce commodity in climate change communication today. The fact that climate change is moving beyond an abstract concept in people’s minds and transforming into real events that we see not only on the news, but also in our local communities, has led to a rise in climate change-induced anxiety in many countries. The sense of hope – and helplessness – that accompanies this can even trigger clinical depression, which the American Psychological Association details in a recent report. The fact that so many people are feeling hopelessly fearful in the face of climate change poses troubling questions about the prospect of making the large-scale policy changes necessary to halt the negative trends. If a positive outcome hinges on the global human population coming together and putting pressure on politicians and stakeholders, as well as on finding the motivation to make necessary changes in our everyday lives, then how do we ensure that hopelessness and apathy doesn’t take hold in the collective psyche? A fear of negative consequences is undoubtedly a powerful tool that’s been tried and tested throughout human history, often in terrifyingly creative ways. But if the fear becomes paralyzing, and hope gives way to a sense of why bother, it’s already too late, then the likelihood of collective action is eliminated along with it. In a recent paper, a group of Austrian and Dutch researchers outline the problem of news reports that rely fully on fear to get the message across. “Threat”, they write, “induces anxiety, avoidance motivation, and vigilance against threatening stimuli”. If people feel too afraid, they will distance themselves from the problem in their minds and turn their focus to more rewarding aspects of life. With an enormous and complex existential threat like climate change – the consequences of which might not be fully understood in their severity until many decades in the future – creating this distance in the mind is all too easy. The fact that the problem is global, and therefore needs global commitment, further complicates matters, since there are likely to be cultural and geographical differences in how communities respond to threatening news. Another issue with using fear as a sole motivator for climate change action is that there’s likely a limit to how long people can sustain the emotion. The Center for Research on Environmental Decisions at Columbia University acknowledges that “appeals to the emotional system may work in the short term, but it is hard for people to retain that level of emotional intensity. People’s attention can easily shift to other issues unless they are given additional reasons to remain engaged”. What is hope without fear? Balancing hope and fear could be the key to achieving constructive climate change communication. Illustration by Matilda Borgström. For anyone on a mission to get people to take action on climate change, it seems that it boils down to finding the right emotional balance in the communication: a balance between hope and fear. Two researchers at Rutgers University recently set out to understand this balance, and used questionnaires to investigate how people responded emotionally to different presentations of climate change impacts and action. The goal was to understand how emotional drivers can push people towards providing the public support necessary for policy change to happen. The researchers found that if a description of measured or predicted negative impacts was presented alongside a description of actions that are taken to mitigate those impacts, it increased hope in the participant, and reduced fear. But, importantly, the results also indicated that fear is not exclusively negative. In fact, fear appeared to make participants more likely to support climate change policies, and the researchers concluded that a degree of fear is necessary for climate change communication to be effective. Apart from the indication that people need to be afraid before they are pushed into action, an important message from the study was that descriptions of impacts alone seem to do little to drive people towards supporting policy change. People also need to hear about what sort of action can be taken, and be shown that there are ways to counteract negative trends. At the same time, only hearing about the action that is taken could reduce people’s fear to the point where the hope becomes, in this context, counter-productive. 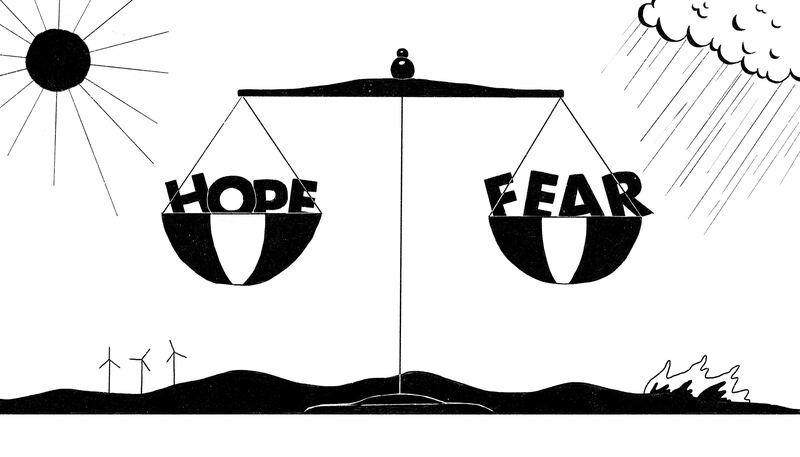 Simply put, a good balance between hope and fear seems to be optimal, and such a balance could be achieved by presenting the severity of the impacts, without sugarcoating, but doing so in conjunction with examples of concrete action that’s being taken to counteract and – hopefully – halt the negative impacts. Examples of “fear-inducing” reporting of climate change impacts, and “hope-inducing” reporting of concrete climate action. Source: The Guardian. So what’s the lesson here? Doomsday reports can surely provide a powerful wake-up call for people that have not previously considered the ramifications of climate change. But the take-home messages of such reports – a recent one from the New Yorker essentially concluding “it’s so much worse than you could ever imagine, and the odds for change are terrible” – are, unsurprisingly, insufficient motivators for action in the average reader, and thus run the risk of sending us humans into collective, anxiety-triggered apathy. Alongside catastrophic scenarios, people need to hear about what can be done – and what’s already being done – to keep the apocalypse at bay. An example of a news outlet that actively combines “doomsday reporting” with journalism about specific actions is the Guardian. In addition to running a week-long special around the release of the latest IPCC report, and introducing their readership to the alarming “hothouse paper” of August 2018, they provide pieces for people feeling overwhelmed by climate change, and run a series called the Upside, in which they highlight positive news stories with the purpose to inspire people to take action on a wide variety of causes. The matter of balancing fear of consequences, and hope for positive change, remains a central issue in climate change communication. Effective communication about climate change is vital, and the future of human life on this planet quite literally depends on it. Finding the right balance between hope and fear is the way forward if we want to make sure that everyone does their part to contribute to change, rather than succumbing to collective resignation and leaving Greta and her peers to fight for that change alone.